To celebrate #LoveLambWeek and Organic September, I have created this Moroccan Lamb Traybake – a show stopping main that takes less than 45 minutes to make and only uses one pan! Perfect for a stress-free dinner party but easy peasy enough to make on a weeknight. Did you know this week is #LoveLambWeek? I am a huge fan of lamb – it’s super tasty, wonderfully versatile and is the basis for a many an easy peasy meal. In fact, some of my absolute favourite recipes on this blog feature lamb: my Lamb Rogan Josh, Lamb Koftes and Slow Roast Ras el Hanout Lamb, for example, are all big favourites. And did you know, this is the time of year we should actually be enjoying British lamb? We usually think of spring as being the time to enjoy lamb and many of us have lamb at Easter, but the main season for British lamb is actually from June to December (If you think about it most British lambs are still gamboling on the hills at Easter). In fact, lamb is still lamb until it is 12 months old (when it becomes hogget) and lamb is often more flavoursome when it’s a little bit older and more mature. The lamb we normally eat at Easter is either from New Zealand (because it’s autumn in New Zealand, when it is spring here) or born in winter from ewes artificially stimulated to get pregnant out of season. Check out this fascinating article for more information on eating British lamb in season. Not only is it #LoveLambWeek, but it is also Organic September, a campaign run by the soil association to encourage us to eat more organic produce. 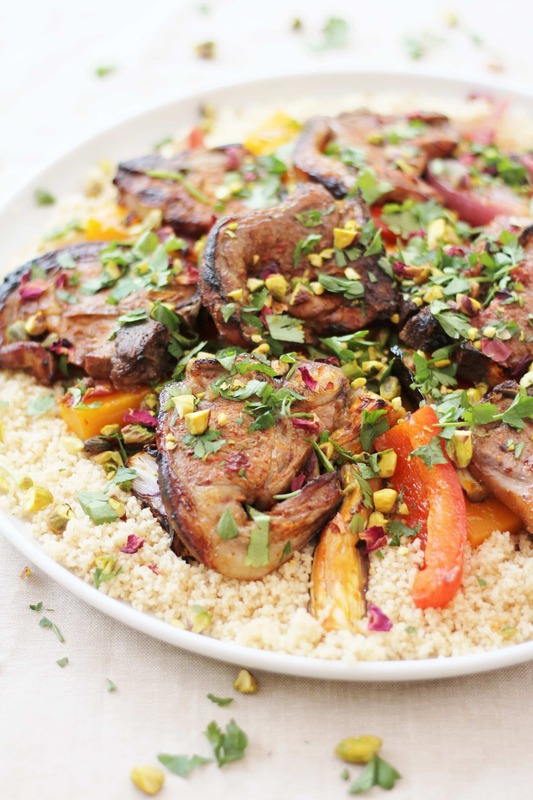 So what better way to celebrate these two events than to cook a delicious dish featuring Organic British Lamb? 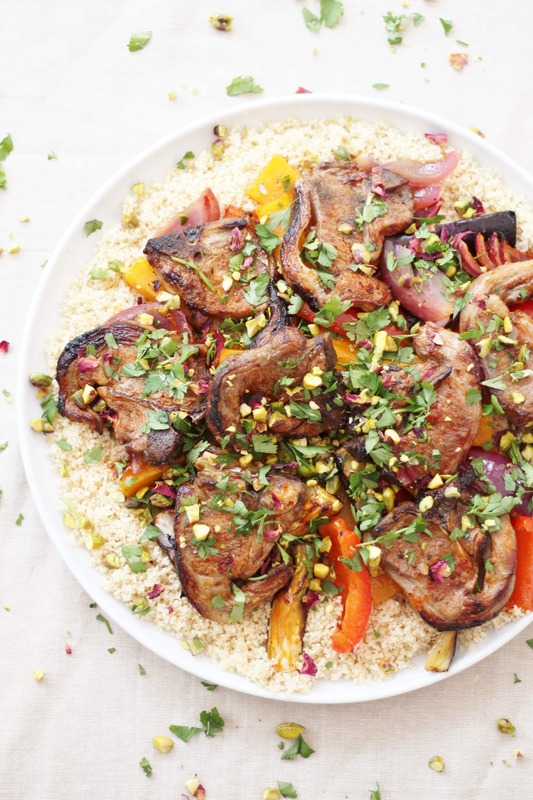 The lamb may be British but this dish is inspired by the flavours of North Africa. Regular readers of this blog will know I am a huge fan of North African flavours and I have the idea of a Moroccan Lamb Traybake in mind for a while – Moroccan spices go so well with lamb – and I have already shared several Moroccan-style lamb dishes on my blog, but I’ve never made a Moroccan inspired traybake before – time to rectify that! I am such a big fan of traybakes as it is such an easy way to cook – throw some vegetables and meat into a tray, pop it in the oven and leave it to do its thing and less than an hour later you have a delicious dinner and hardly any washing up. 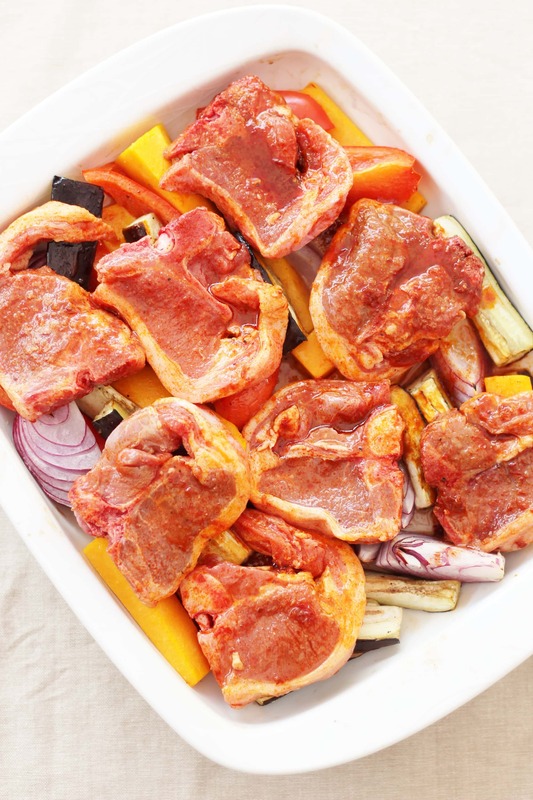 I have chosen lamb chops for this dish as they cook very quickly in a hot oven and so are perfect for a quick and easy dinner when time is short. They are also easy to get hold of – and you can usually buy organic ones – not all cuts of lamb are easy to source if you want to buy organic – I got these from Tesco. To flavour the lamb I have used a very simple marinade made from harissa, lemon juice, olive oil and honey – if you have got time, you could marinade the lamb for an hour or more but, if time is tight, just 10 minutes will do – the rest of the marinade gets thrown into the traybake too, so the flavours permeate the whole dish. I have also roasted some delicious veggies in the tin: butternut squash, aubergine, red onion and red pepper – you could throw in some bashed up cloves of garlic too if you like. Make sure your veggies are starting to roast nicely before you add the lamb chops, as the chops don’t need as long to roast. I like to roast the veggies first for 15 minutes and then add the lamb and cook for a further 15 minutes – the lamb should be just pink inside and the veggies slightly charred. To enjoy with this dish, I recommend a Cotes du Rhone, another Grenache based blend from Southern France or a Garnacha from Spain. Alternatively, if you can find one, a red from Morocco would work well here! To celebrate #LoveLambWeek and Organic September, I have created this Moroccan Lamb Traybake - a show stopping main that takes less than 45 minutes to make and only uses one pan! Perfect for a stress-free dinner party but easy peasy enough to make on a weeknight. 1 tablespoon harissa paste be careful – harissa pastes can vary in heat levels! Preheat your oven to 220C and prepare your veg. 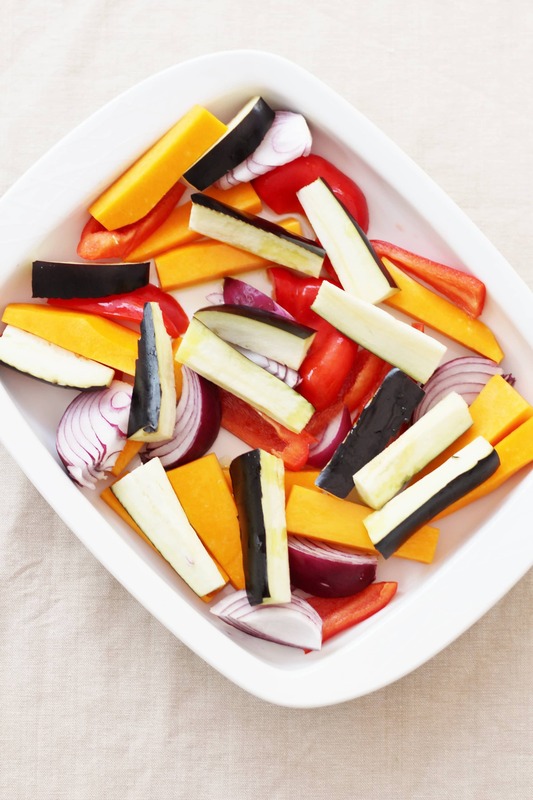 Put the butternut squash, aubergine, pepper, onion and garlic (if using) in a roasting tray and add a tablespoon of olive oil, plus some salt and pepper. Toss the veggies in the oil and then put the tray in the preheated oven for 15 minutes. Meanwhile mix together the marinade ingredients and add the lamb. 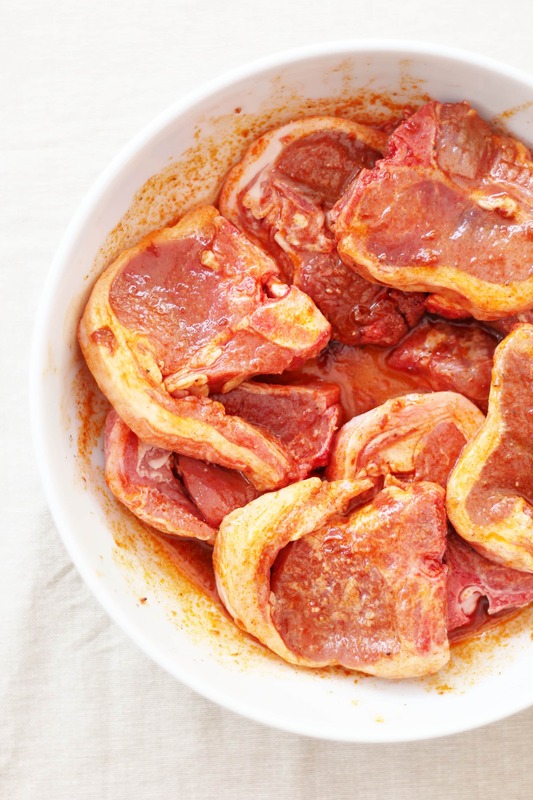 Turn the lamb in the marinade to ensure it is thoroughly coated and leave for 10 minutes (do this earlier and marinade for longer if you can). When the veggies have been roasting for 15 minutes, remove them from the oven and give them a stir. Arrange the lamb on top and tip over all of the marinade. Cook for a further 15 minutes and then remove from the oven and allow to stand for 5 minutes. 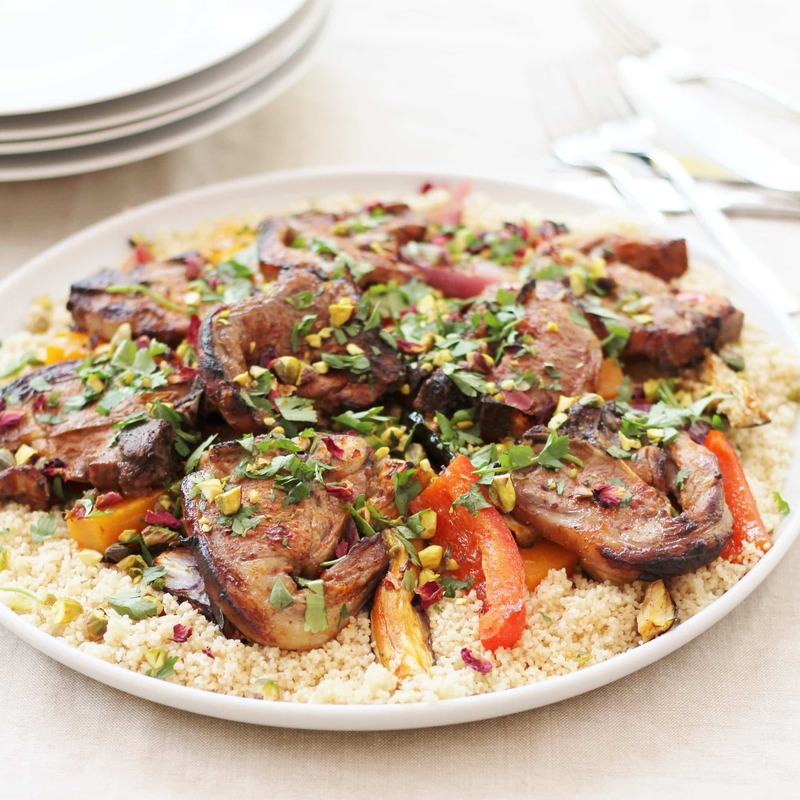 While the traybake is cooking, prepare the couscous. Weigh out the couscous into a large bowl, add salt and pepper to taste (I do about 10 twists each) and then pour over the boiling water. Cover with a plate and leave to stand for 10 minutes. Fluff with a fork. Finally prepare the garnish by mixing together the garnish ingredients. 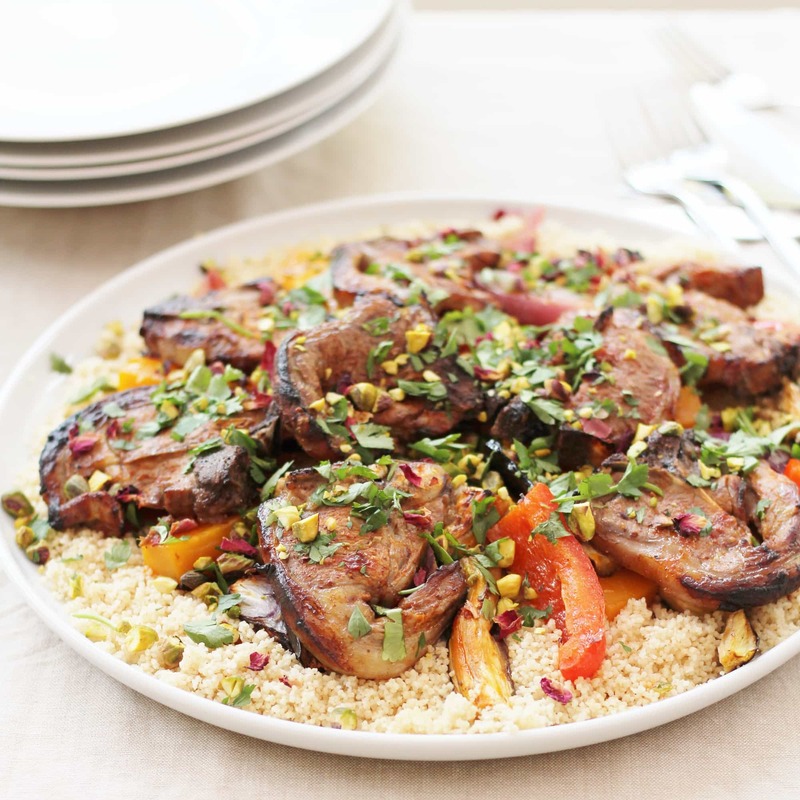 To serve, tip the couscous out onto a large serving platter, arrange the veggies and then the lamb on top and scatter over the garnish. Enjoy with a good bottle of red or rose wine! I am linking this up to Recipe of the Week, Brilliant Blog Posts, The Food Calendar, Cook Once Eat Twice, Cook Blog Share and Sunday Fitness and Food (co-hosted by Marathons & Motivation and Ilka’s Blog). 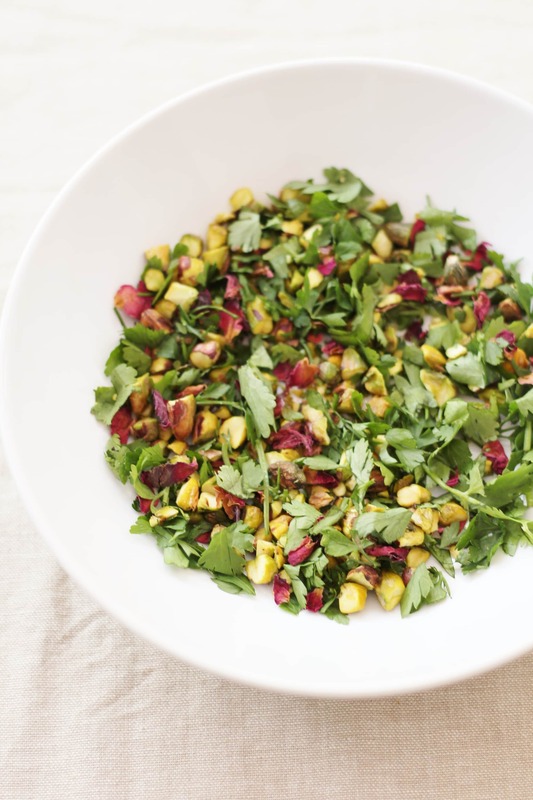 This looks so tasty and I love the sound of the herb and pistachio garnish! I don’t think I use pistachios enough but they are really tasty and I bet they give this dish a real North African flavour. Thank you so much for sharing with #CookOnceEatTwice – I am always tempted by your recipes! It is showing up in the linky now too. Always love the sound of your lamb dishes and this one is no exception.